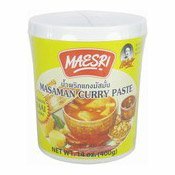 Cooking Directions: Fry curry paste in vegetable oil and then cook with coconut milk, meat, fish sauce, palm sugar, tamarind paste and vegetables. Ensure fully cooked before serving. Allergy Advice: Contains Shrimp, Crustacean. Suggestions: Store in a cool dry place. After opening, keep refrigerated and consume within 60 days. Ingredients: Dried Chilli, Garlic, Onion, Lemongrass, Galangal, Salt, Kaffir Lime Skin, Shrimp Paste (Shrimp (Crustacean), Salt), Pepper, Coriander Seed, Fennel, Cardamom. 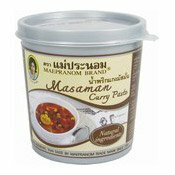 Simply enter your details below and we will send you an e-mail when “Masaman Curry Paste (Massaman) (泰式馬斯文咖喱醬)” is back in stock!